According to the World Allergy Association, penicillin, aspirin, and sulfonamides account for over 80 percent of allergic drug reactions worldwide. Approximately 1 to 3 percent of patient courses of penicillin are complicated by allergic reactions. Penicillin is the most common cause of anaphylaxis. It can occur minutes after taking the drug and can be fatal if not treated right away. Anaphylaxis requires an immediate epinephrine injection and hospital care to maintain blood pressure and support breathing. Prompt diagnosis is vital for drug hypersensitivity such as an allergic reaction to penicillin. A medical alert ID can help in emergencies when timely identification and early withdrawal of a suspected drug can be vital. It can also help avoid exposure and re-exposure to the offending penicillin medicine. Information about a person’s allergy to antibiotics can save a life. A study shows that surgical site infection was found to be 50 percent higher in patients with a reported penicillin allergy. This why people who are allergic to penicillin are recommended to inform medical providers before being administered treatment. 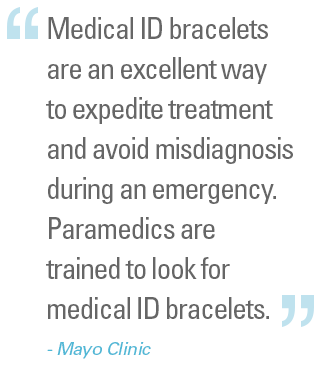 A medical ID bracelet or necklace can speak for you in emergencies when you may be unconscious or unable to. If an allergist or immunologist recommends that a person carries allergy treatment or supplies like an epinephrine autoinjector or epi pen, information on the epi pen's location such as it being inside a bag or pocket can be included on a custom-engraved medical alert bracelet or necklace. Your drug allergies such as an allergy to penicillin and/or related medications, and other medical conditions that you may have. Note: An allergy to penicillin might mean having to avoid all drugs in the immediate penicillin family such as amoxicillin, for example. Ask your allergist or immunologist for advice if other types of drugs need to be engraved on your medical ID. Important reminder: Only wear a penicillin allergy medical alert jewelry after a confirmed diagnosis such as from positive penicillin challenge or allergy testing. A misdiagnosed penicillin allergy may result in the use of less-appropriate or more-expensive antibiotics without penicillin. Please consult your doctor or allergist for more information.